Posted On December 3, 2018 at 1:23 pm by admin / Comments Off on Why use whiteboards in a classroom? Whiteboards, or small dry erase boards, allow students to work collaboratively in small groups, and present their thinking in a visual way as part of the learning process. Using whiteboards, students working in groups can “report out” to the entire class. More than one student can contribute to the group’s whiteboard, so students can easily fix their errors, revise their thinking, and rewrite their ideas. The teacher can walk around the classroom and observe the development of students’ thinking as they write their whiteboards. This fosters communication between the teacher and students, and among students. A modeling approach to teaching physics emphasizes constructing and applying conceptual models. 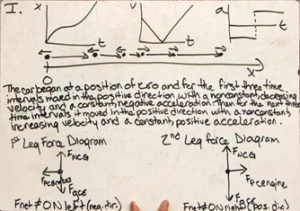 Whiteboarding is an important part of this approach, as it gives students opportunities to articulate their developing models, refine their thinking, and present their results to the class. What do teachers gain from whiteboarding? Improved learning through increased participation and collaboration among students. Alternate methods of learning (visual and auditory). A tool to manage instruction so that students can construct their own knowledge and understanding from evidence. A quick and cost-effective way of formatively assessing students. Help in diagnosing students’ misconceptions. Insight into the strengths and weaknesses of the class in understanding a particular concept or phenomena so that scaffolding can be provided. Jackson, J., Dukerich, L., & Hestenes, D. (2008). Modeling instruction: An effective model for science education. Science Educator, 17 (1), 10- 17. N. Muslu, D. Hanuscin, S. Sinha, A TIME for Physics First Newsletter, Dec 2010.